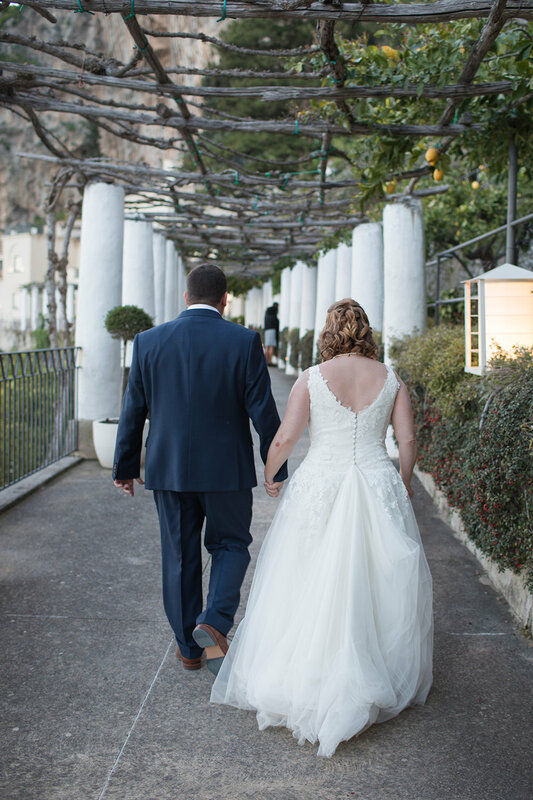 We love destination weddings- especially when they take us to one of our favorite places- the Amalfi Coast of Italy. Laura, a native of Washington DC, and Steve, a native of South Africa, live in London and wanted a location in between their native homes where friends and family would be excited to visit. They wanted a hotel with a reputation for great service and unique architecture that would provide a gorgeous setting for their wedding. The NH Gran Convento Hotel di Amalfi, a converted 13th century convent built into the cliffs of Amalfi, fit all of their parameters. 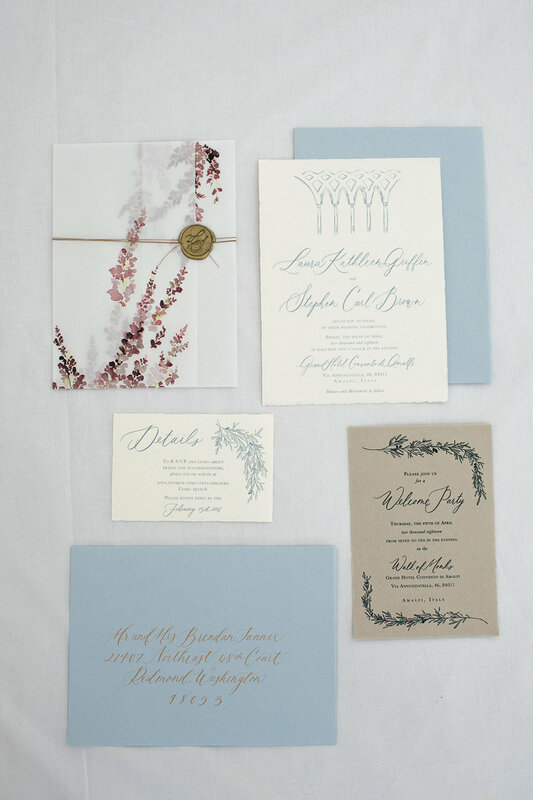 Invitations are the best way to shape your guests' expectations and give them a sense of what your wedding will be like. 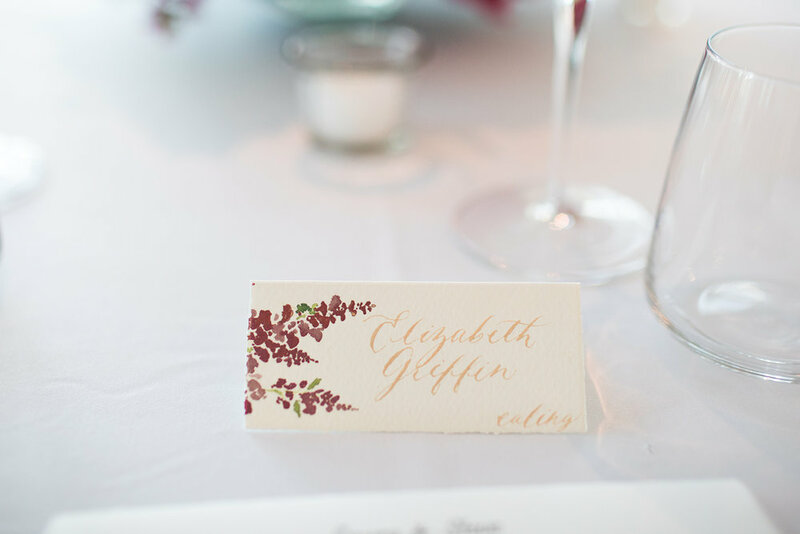 Nicole of Every Little Letter killed it with this stationery! 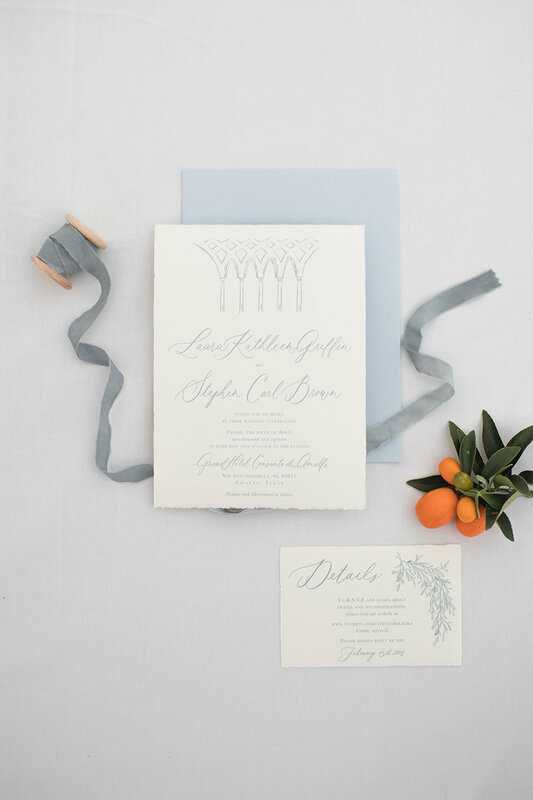 Printed on Italian paper, the stationery featured architectural and botanical elements from the Amalfi Coast. 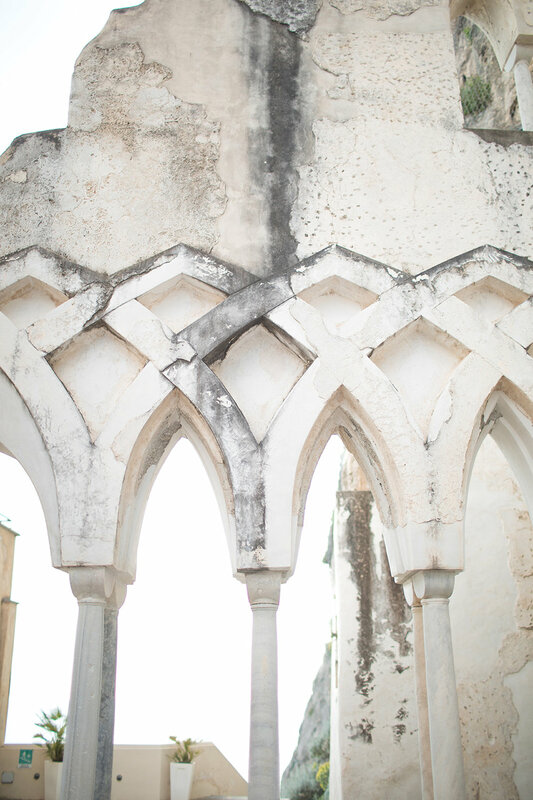 The arches of the Gran Convento’s courtyard served as the focal illustration for the invitation. The vellum wrap which was tied with string and sealed with a custom gold wax seal featured a watercolor painting of bougainvillea, whose blooms cover the patios of the hotel in April. 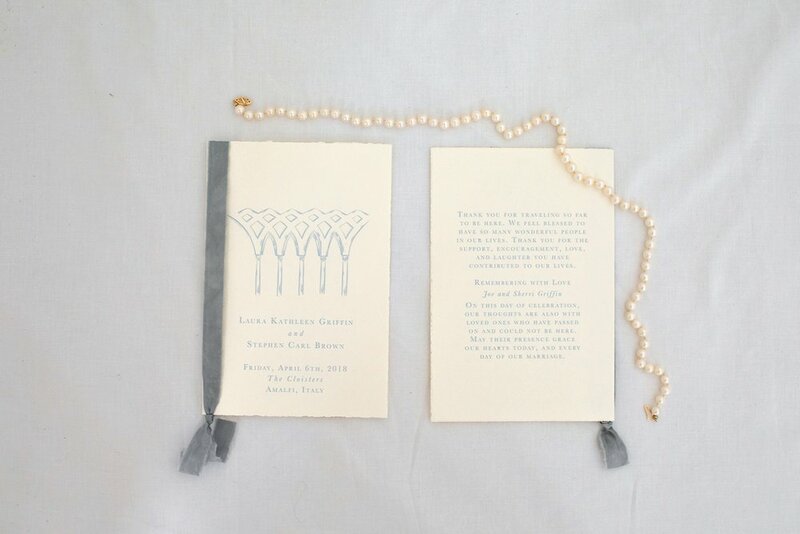 The details card featured olive branches which grow in the hotel’s terraced gardens. 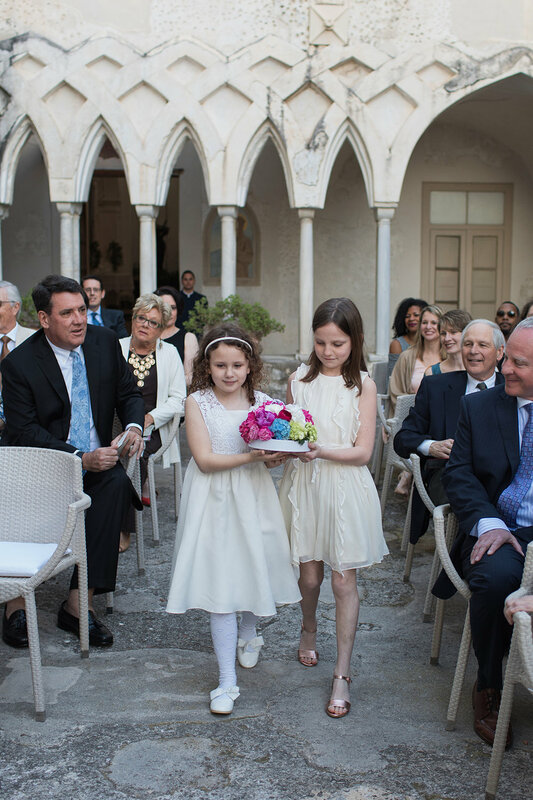 They set the tone for a beautiful, intimate Italian wedding. Laura and Steve initially expected only a small group of 25 family and friends to make the trip to Italy. In December, the confirmed list reached 53 guests from five continents, and we enlisted the expertise and support of Heather Christopher Travel to assist with guest transportation and activities. With Heather on board, the guests each received their own app-based itinerary, a personal shuttle to and from the hotel, and unbelievable support in making travel plans. 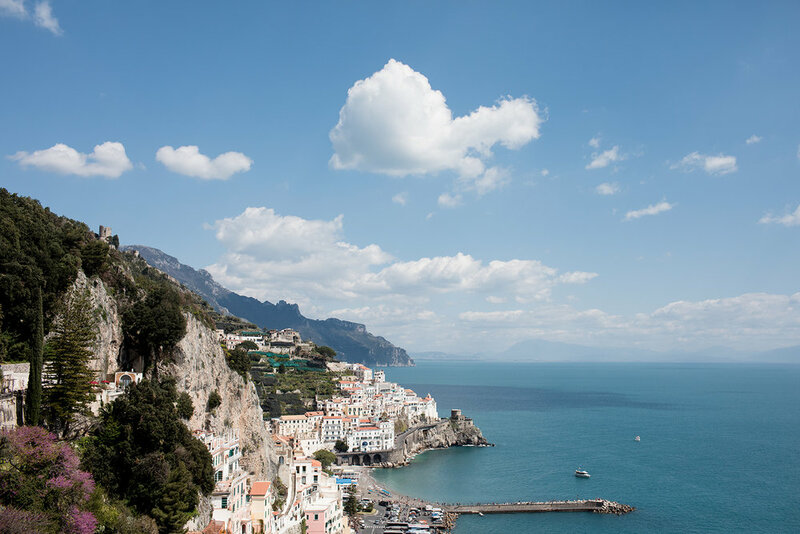 When they RSVP’d, guests were offered a large list of activities from which they could select to experience in Amalfi. Guests experienced winery tours, a tour of the Amalfi Coast by private boat, pasta making classes and private tours of Pompeii and Herculaneum. As wedding planners, this meant so much to know the guests were well cared for and we could focus on the wedding itself. 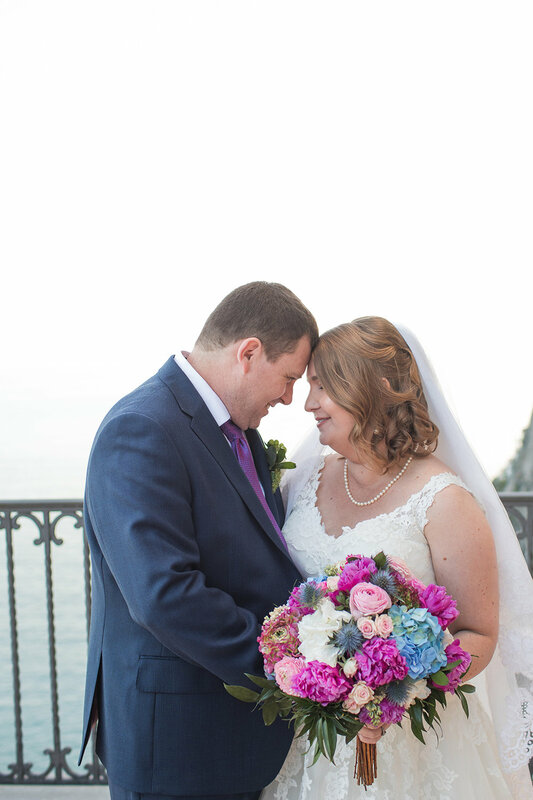 Laura and Steve wanted to express their appreciation to their guests coming to Amalfi. Welcome bags greeted each guest in their hotel room. The welcome party was laid-back three-course dinner featuring fresh seafood, pasta and a classic tiramisu requested by the groom. Steve and Laura spent time with each guest and lingered over Italian wine. Every morning of the wedding week, guests gathered on the terrace for cappuccinos, fresh fruit, pastries and acai bowls. The wedding day was no exception. Steve and Laura chatted with guests and enjoyed the sun before preparing for the wedding. It was one of the most laid back, enjoyable wedding mornings I’ve seen. The day progressed at a relaxed pace as Laura gathered with her college friends to get ready. 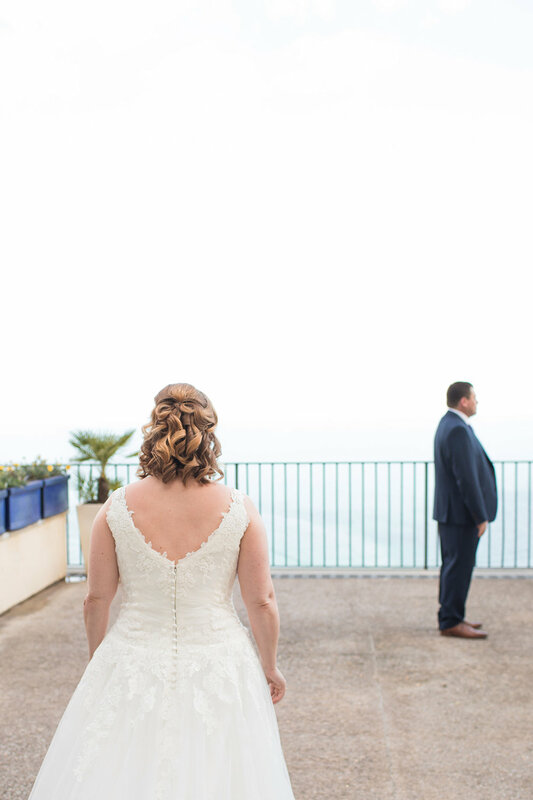 Her bridal suite opened onto a private terrace overlooking the Mediterranean Sea- clearly the only place for a first look! 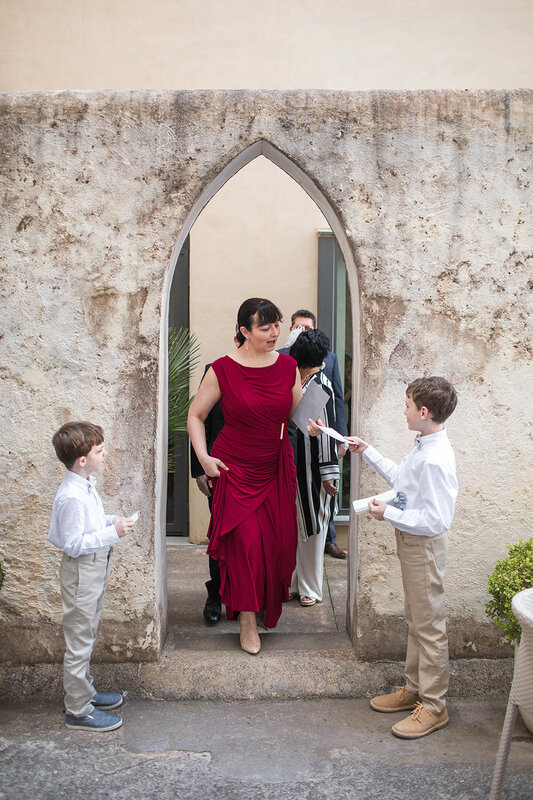 Laura's dress came from a boutique in Notting Hill who provided a custom shrug and tailored her mother's veil for her dress. 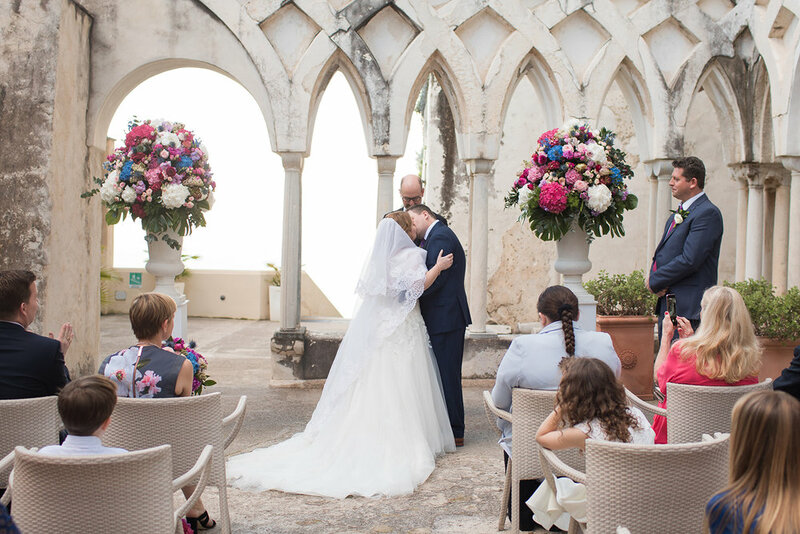 The ceremony location was one of the major draws to the NH Gran Convento. Every so often, Laura and I would muse as to whether we should try to decorate it more or let it stand on it’s own. Ultimately, based on Laura and Steve’s personal style, we decided to add minimal decor. Two large arrangements by Pasquale Carrella flanked the front of the ceremony area. 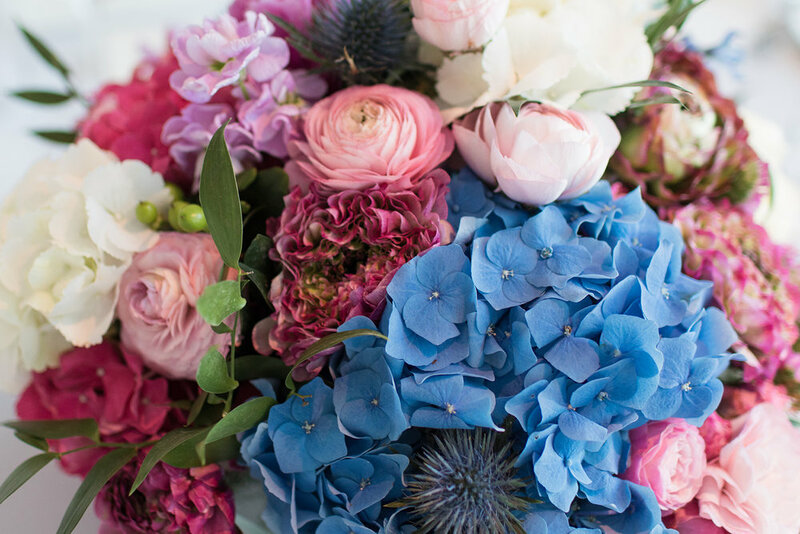 Laura wanted hues that would evoke the color of the mediterranean and the blooming bougainvillea. Steve’s son and Laura’s nephew passed out programs to guests as they arrived while a cello and violin provided music. The wedding party included a childhood friend of Steve’s, and Steve’s two children and Laura’s two nephews and niece. Pasquale Carrella surprise-gifted Laura with a “ring-cushion” as he called it. The flower girls carried this beautiful mountain of flowers with the rings tied on it (the 8 year old boys did not want to carry flowers). Cocktail hour took place on the Walk of Monks with the cello and violin playing jazz standards while guests sipped prosecco. 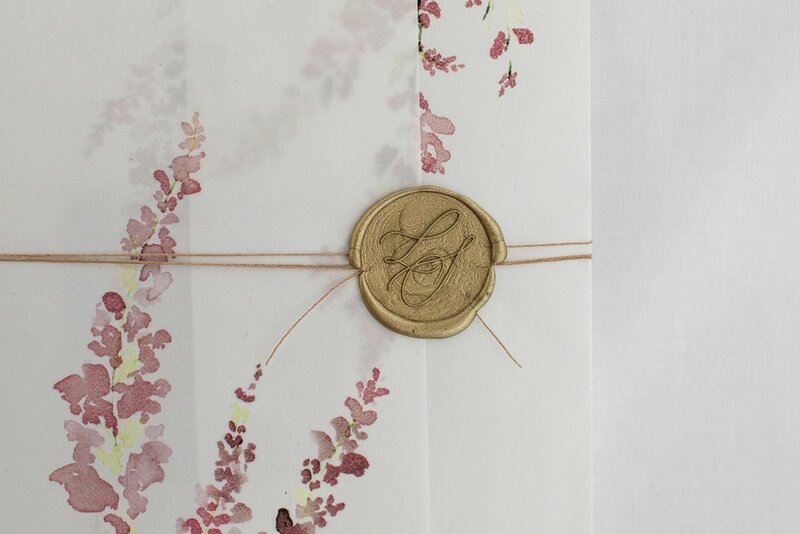 A guestbook featured mini-envelopes made from maps which guests filled with notes and well wishes for the newlyweds. Guests moved inside to enjoy a four-course dinner with live music creating a festive atmosphere. Italian wines, prosecco and San Pelligrino (of course!) accompanied an arugula salad, seafood pasta, veal and “Amalfi Delight”--a dessert filled with fresh fruit and meringue. All followed by wedding cake. As guests departed, they received limoncello made in Amalfi to enjoy on their way back home.